After more than four hours of heads-up battle with Men Nguyen, Jeffrey Papola has finally won his first WSOP bracelet. This is his second shot at it in four days as well. 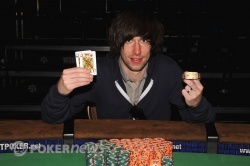 He finished second in the previous six-handed event, a $2,500, outlasting 1,243 people. Then he turned around and started all over again in the $5,000 six-handed tournament. And this time, the law student/poker pro from New York City bested all 567 opponents and closed the deal. The $667,443 he gets for first boosts Papola to more than $1.1 million in career WSOP earnings. Men Nguyen refused to go quietly but after surviving a remarkable number of all-ins, he simply couldn't hang on any longer. Though he didn't pick up a second 2010 bracelet, Nguyen earned enough points for his second place finish to tie Michael Mizrachi and James Dempsey for the top spot in the WSOP Player of the Year race. Twelve players returned for Day 3, meaning six had to hit the rail pre-final table. Lucas Greenwood was the first to go in 12th place, followed by French pro Anthony Roux. Evan Panesis, Paul Sheng, and Darren Elias were also eliminated to bring the field down to seven. Taylor McFarland and Erick Lindgren had been tangling in big pots all day, and it seemed inevitable one would take out the other. On the final table bubble, McFarland picked the wrong spot to test Lindgren and wound up out in seventh. Lindgren outlasted McFarland to get to the final table, but he didn't make it any further than that. Lindgren picked up queens and came very close to folding to Men Nguyen's cold four-bet, but E-dog made the call and was eliminated in sixth place at the hands of Nguyen's pocket kings. Orlando Delacruz was next to go in fifth, followed minutes later by Bruno Launais in fourth. After all that action, Nguyen, Papola, and Mark Radoja played three-handed for three hours without an elimination before dispatiching a disappointed Radoja in third place. Papola held a better than 3:1 chip lead when heads-up play began. Two hours later, Nguyen took over the chip lead. And for the next two hours, they traded it back and forth until Papola finally finished off the Master. The next six max event, the much anticipated debut of the $25,000 Six Handed No-Limit Hold'em tournament, will begin on Wednesday, June 30th. Can Papola final table that one too? Stay tuned to PokerNews for live coverage of that event and every one in between. Jeffrey Papola raised to 320,000 with the button, Men Nguyen moved all in for a little over 2,000,000 and Papola snapped it off. The few people that were left in the ESPN arena rushed to the stage to catch the flop. You could hear a pin drop as the dealer wrapped the table and the fell on the turn. Somebody called for a nine from Nguyen's rail, but in actuality only a king would double him. The river was high, but the was not enough and Nguyen was eliminated in second place. He shook Papola's hand before collecting his things and stepping away from the table. Nguyen's smile disappered quickly though, and he had a few unkind words for one of the dealers. Hopefully, $412,746 will put a smile on Mr. Nguyen's face. Jeffrey Papola raised to 300,000 preflop, and Men Nguyen called. The flop came out , and Nguyen checked. Papola bet 375,000, and not surprisingly, Nguyen check-raised. But his 900,000 bet was much larger than usual. Either Papola had a monster or sniffed out the sizing, because it only took him a minute to announce "all in." Men froze. He started the tanking process, but this was different. He looked miserable, counting down what was left of his stack, his eyes darting around the room as if hoping help would come from somewhere. After three minutes, he acknowledged the inevitable and gave up his hand. Nguyen is down to 2.5 million, and Papola is back to a commanding lead with 6 million. He raised to 320,000 with the button, and Men Nguyen called. They checked it down and the board ran . "Three," Papola uttered opening . Nguyen folded and Papola is back ahead. Jeffrey Papola bet 175,000 on a board, and Men Nguyen called. The river was the , and Nguyen bet out 400,000. Papola called the large bet but mucked when he saw Men's for top pair with a jack kicker. With that hand, Nguyen took back the lead. Jeffrey Papola raised to 320,000 with the button and Men Nguyen called. 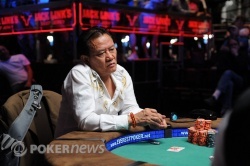 The dealer fanned and Nguyen led for 200,000. Papola called. Both players checked the on the turn and the on the river. Nguyen showed for ten-high and Papola showed for ace-high. Papola is back in the lead with 4,720,000. The two checked all the way down and the board read . Nguyen opened and Papola mucked. Jeffrey Papola completed the small blind, and Men Nguyen checked the big to get to an flop. Men checked, and Papola bet 160,000. 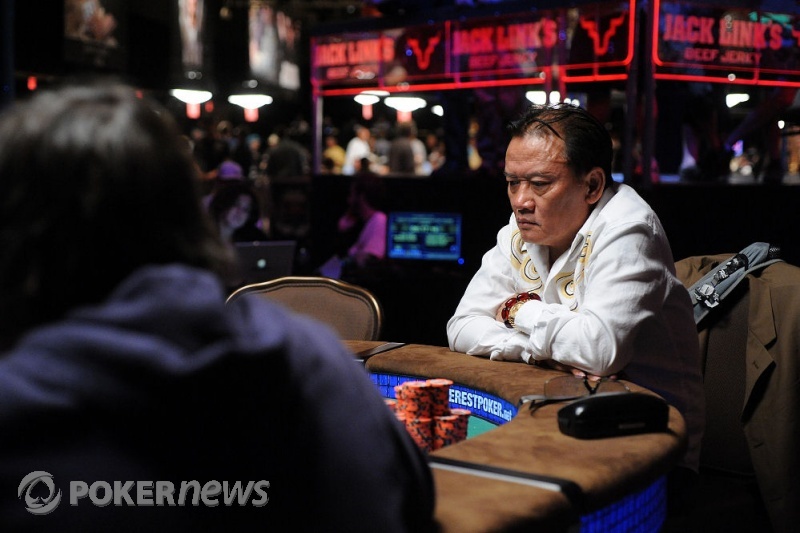 Then Nguyen raised to 350,000 total, and Papola folded to the small check-raise. Men Nguyen limped in with the button and Jeffrey Papola checked. The flop fell and the two checked. They both checked the on the river as well. After the rivered Nguyen led for 200,000 and Papola called. Nguyen showed the and Papola mucked his hand.